The already tarnished image of the United States in Pakistan has worsened over the past year. Currently, just 12% of Pakistanis view the U.S. favorably; in 2010, 17% saw America in a positive light. However, reactions to the U.S. raid that killed Osama bin Laden had no observable impact on the overall image of the U.S. In polling conducted immediately prior to the military operation, favorable opinion of the U.S. had already slipped to a level rivaling its lowest in nearly a decade. In general, the U.S. military operation in Abbottabad has had little impact on attitudes toward the U.S. or its policies. On a range of indicators – from opinion of President Obama, to views of the U.S. as a partner, to support for U.S.-led efforts to combat terrorism – Pakistani opinion had already turned more negative prior to the deadly strike against bin Laden. The one exception is Pakistani awareness of U.S. aid, which actually increased in the wake of the May 2 operation. Pakistanis worry about U.S. intentions toward their country: nearly seven-in-ten consider the U.S. to be more of an enemy, than a partner to their country. Meanwhile, a similar number say they are worried that the U.S. could pose a military threat to their country. In contrast, nearly nine-in-ten describe China as a partner to Pakistan. In terms of world affairs, most Pakistanis continue to see the U.S. acting unilaterally. Only one-in-five says the U.S takes into account the interests of countries like Pakistan when making foreign policy decisions. Among the Pakistani public, roughly six-in-ten oppose U.S.-led efforts to combat terrorism, while nearly seven-in-ten think the U.S. and NATO should remove their troops from Afghanistan as soon as possible. When it comes to U.S. foreign assistance, more than six-in-ten Pakistanis say the U.S. extends at least some financial aid to their country, although only about a third claim the U.S. provides “a lot” of financial assistance. Interestingly, the number acknowledging U.S. aid to their country is up from last year, and is still higher in the wake of the U.S. raid that killed bin Laden. Among those who credit the U.S. with extending a helping hand to Pakistan, opinion is divided as to whether the amount of U.S. aid is increasing or decreasing. Those who believe the U.S. provides at least some aid to Pakistan also differ about the nature of the aid: more than a third say it is mainly intended to boost economic development, while about a fifth think it is primarily military-related. Favorable opinion of the United States is near its lowest point in almost a decade in Pakistan. 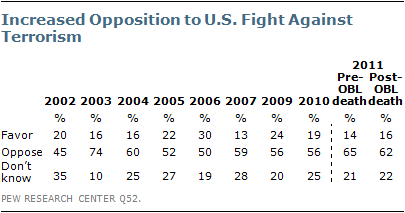 Currently, 12% express a favorable opinion of the U.S, down five percentage points from 2010. Polling before and after May 2 confirms that this latest decline in U.S. image actually preceded the U.S. raid that killed bin Laden. President Obama receives extremely low marks in Pakistan. Only about one-in-ten (8%) express at least some confidence in the American president to do the right thing when it comes to world affairs. More than two-thirds (68%) of Pakistanis say they have little or no confidence in Obama, while roughly a quarter (24%) offer no definite opinion. Overall, the percentage of Pakistanis saying they lack confidence in the American president has increased steadily since 2009, ticking up 8 percentage points in just the last year. Today, Obama’s ratings are as low as former President George W. Bush’s were in 2008. 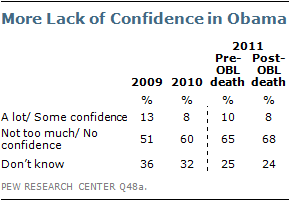 The recent U.S. strike against bin Laden did not substantially impact already waning confidence in President Obama. Many Pakistanis question U.S. intentions toward their country. Roughly seven-in-ten (69%) think America is more of an enemy than a partner to Pakistan – a view that gained traction even prior to the U.S. military operation in Abbottabad. 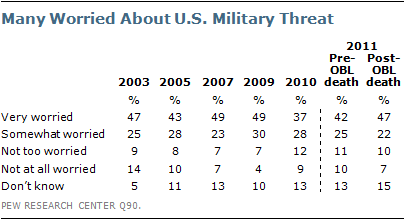 In 2010, fewer (59%) described the U.S. as an enemy. In contrast, a large majority of Pakistanis (87%) say China is a partner to their country. Virtually no one (1%) identifies it as an enemy. 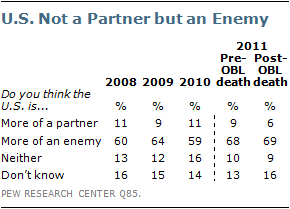 The notion that China is more of a partner than enemy has been the dominant view among the public since 2008. A solid majority of Pakistanis (69%) are either very or somewhat worried that the U.S. could someday pose a threat to their homeland. Nearly half (47%) say they are very worried, up 10 percentage points from 2010 and five points since the April poll. Concern about the threat posed by the U.S. is especially evident in Pakistan’s most populous province, Punjab (81%). A smaller majority in Sindh (56%) say they are worried that America could pose a military threat some day, while fewer in Khyber Pahktunkhwa (48%) and Baluchistan (42%) express the same level of concern. Just one-in-five Pakistanis believe the U.S. takes into account the interests of other countries when making international policy decisions. This assessment is virtually unchanged from last year, when 19% offered the same opinion. Many Pakistanis oppose U.S. anti-terrorism efforts, as well as the presence of U.S. and NATO troops in Afghanistan. Opposition to the U.S.-led campaign against terrorism notched up slightly over the past year – rising from 56% in 2010 to 62% in 2011. Notably, the U.S. raid that killed bin Laden did not substantially influence Pakistanis’ opinion about the U.S. approach to fighting terrorism. Meanwhile, a clear majority of Pakistanis (69%) say the U.S. and NATO should withdraw their troops from Afghanistan as soon as possible, rather than wait for the situation to first stabilize. Support for the immediate withdrawal of U.S. and NATO troops has been consistently strong since 2007. Pakistanis residing in the Punjab region voice greater opposition to U.S.-led anti-terrorism efforts (72%) than counterparts in either Sindh (56%), Khyber Pahktunkhwa (47%) or Baluchistan (22%) (74% in Baluchistan offer no opinion). In addition, those who identify with the Pakistan Muslim League-Nawaz (PML-N) are more opposed to the U.S. approach to combating terrorism than are supporters of President Asif Ali Zardari’s Pakistan Peoples Party (PPP) (71% vs. 50%). Opinion about the withdrawal of U.S. and NATO troops from Afghanistan also varies by party affiliation, with 71% of PML-N backers saying troops should be removed immediately, compared with 54% of PPP supporters. When asked how much financial aid the U.S. gives their country, 38% of Pakistanis say it gives a lot, 21% say it gives a little, and 13% say it gives hardly any financial assistance. Just 5% say America provides no assistance to their country, while about a quarter (24%) are uncertain how much aid Pakistan receives from the U.S. 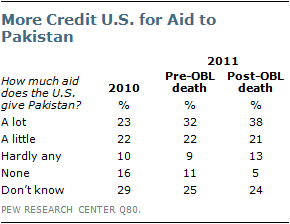 The percentage of Pakistanis who say the U.S. provides a lot of aid to their country has increased substantially from a 2010 survey conducted prior to widespread flooding in Pakistan and the provision of significant humanitarian aid by the U.S.; just 23% credited America with giving Pakistan a lot of financial assistance in 2010. Notably, the number of Pakistanis holding this view increased not only before the U.S. military operation in Abbottabad, but rose still further after the raid. This may be due to Pakistani media reporting more intensely on all aspects of U.S.-Pakistani relations after the strike that killed bin Laden. Awareness of U.S. aid is most widespread in Sindh province, where more than eight-in-ten (84%) say the U.S. provides Pakistan with at least some financial assistance. Smaller majorities in Punjab (72%) and Khyber Pahktunkhwa (57%) also acknowledge that their country receives aid from the U.S., while just 29% in Baluchistan are aware of U.S. assistance. Among those who credit the U.S. with extending a helping hand to Pakistan, opinion is divided as to whether the amount of U.S. aid is increasing or decreasing. Currently, 29% of Pakistanis believe the level of U.S. assistance to their country is increasing, compared with 38% who say it is decreasing and 22% who think it is staying the same. The number of Pakistanis who say U.S. aid is increasing is actually slightly lower than before the U.S. raid in Abbottabad, when 35% believed assistance to their country was on the rise. Those who believe the U.S. provides at least some aid to Pakistan differ about the nature of the aid. Almost four-in-ten (37%) say it is mainly intended to boost economic development, up from 27% in 2010; 22% say it is primarily military-related. About a quarter (23%) believe U.S. aid is aimed at supporting both the economy and military, while 18% do not offer an opinion.